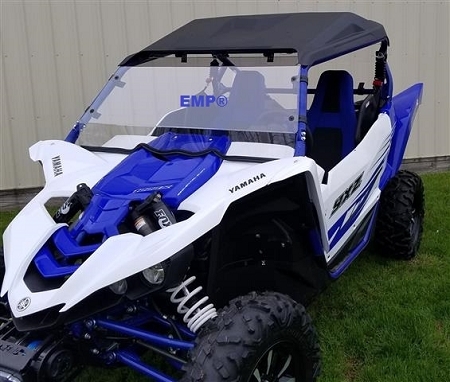 Yamaha YXZ Hard Coated Full Windshield P/N: EMP-13190 Fits: 2016 YXZ 1000 EMP® offers a Half Windshield P/N: 13189 and a back Dust Stopper P/N: 13201 in addition to the this front windshield. Made from 3/16” Thick Hard Coated Polycarbonate. Attaches with EMP Rubber Fast Straps. DOT Rated and etched into the shield. Tool-Less Removal. Gasketed along to bottom to seal and protect your hood. Attaches to the top cross tube also. Made In Cleveland Ohio (Not China). Protect the driver and passenger from wind and rain with this Hard Coated Polycarbonate Windshield. Polycarbonate is virtually unbreakable under normal use unlike other cheaper acrylics on the market. This is also hard coated on both sides, with proper care this product should last the life your buggy. It attaches with EMP®’s Rubber fast straps allowing it to be removed in seconds without any tools. Unlike others on the market it extends all the way to the cross bar on the top. We reserve the right to make modifications/improvements to our products at any time. Vehicles may have changes throughout the year. Therefore, pictures are a representation of the product you will be getting but may vary due to product revisions.